M.Phil. (Sanskrit) is a one year course. Eligibility for the course is bachelor’s degree in psychology and intermediate cleared. Admissions to such course are based on scores of entrance test conducted by University of Delhi etc. Students have to go through personal interviews after clearing the entrance test to get admission into respective course. The tuition fees by average for M.Phil. (Sanskrit) comes between INR 4,000 to 2 Lakh for the span of one year. Major Job profile and designations for these graduates are Sanskrit Proof Reading, Teacher, Customer Service Associate, Sales Coordinator (with Sanskrit), Interpreter (from one language to other), Content Writer - Editor (Sanskrit), Sanskrit Translator, Part Time Trainer – Sanskrit, Assistant Professor - Sanskrit Journalism, Data Entry Operator, Tele-caller – Sanskrit, and alike. Graduates with this degree have opportunity for the industries like Colleges and universities, private organizations, private academic institutions, translation service providers, tourism sector, print media organizations, TV channels, Freelancers join research firms, translation bureaus, publishing houses, international organizations, hotel industry, travel and tourism sectors, among other areas. The average salary for M.Phil. 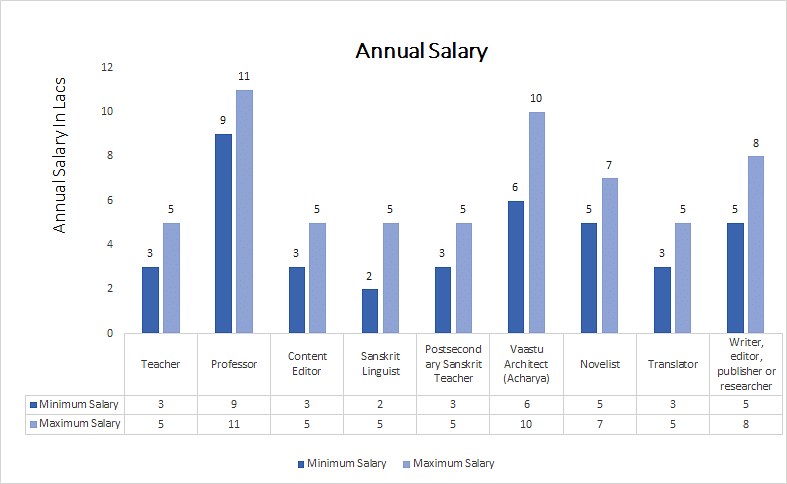 (Sanskrit) graduates is around INR 2 to 6 Lakh but this can be higher on the basis of experience and other factors. Top Recruiting Companies Colleges and universities, private organizations, private academic institutions, translation service providers, tourism sector, print media organizations, TV channels, Freelancers join research firms, translation bureaus, publishing houses, international organizations, hotel industry, travel and tourism sectors, among other areas. Job Positions Sanskrit Proof Reading, Teacher, Customer Service Associate, Sales Coordinator (with Sanskrit), Interpreter (from one language to other), Content Writer - Editor (Sanskrit), Sanskrit Translator, Part Time Trainer – Sanskrit, Assistant Professor - Sanskrit Journalism, Data Entry Operator, Tele-caller – Sanskrit, and the like. M.Phil. (Sanskrit): What is it about? Master of Philosophy (Sanskrit) course aims to train students in the field of Sanskrit computational linguistics, the traditional sabdabodha theories, and thus bridging the gap between the present and past. The module provides students with a basic knowledge of Sanskrit and practice of using Sanskrit in a variety of everyday situations. This study allows students to interact with Sanskrit speakers and to acquire familiarity with the Sanskrit script. This course provides students with a basis to approach research topics relating to Sanskrit literature and culture. They will be exposed to the basics of computer programming, logistics, statistics, Sanskrit and NLP in addition and strengthening their basics in Vyakarna. This course helps students to gain knowledge on Sanskrit language and their scripts. They should practice this language to write, read, and translate in many languages as per the requirements. They will learn Sanskrit letters, punctuations, words, sentence formation etc. The common requirement for pursuing M.Phil.in Sanskrit course is a pass in Master’s degree in the respective subjects with at least 55% of the aggregate marks from any recognized university. Those students who are in their final year are also eligible to apply for M.Phil. in Sanskrit. The minimum age to get entry to this course is 22 years. Most of the colleges arrange entrance test and interview for admission in M.Phil in Sanskrit. Yet few colleges like Kurukshetra University and IGNOU provide direct admission for acquiring distance-learning. Those who want to put up a career in teaching foreign languages can start earning in the range of INR10,000 to 20,000 per month. Candidates working with embassies can receive a compensation of INR 8,000 p.m. to 10,000 p.m. Translators are paid between INR 50 to 100 per page. Interpreters generally earn around INR 300 to 500 per hour. Numerous opportunities are available for aspirants in this field after successful completion of the course. Some of the major fields which graduates can work in are: teaching, civil services, and research. Candidates can also opt for a career in teaching. They can work as Sanskrit teachers, lecturers in many schools and universities/colleges. These professionals teach and guide about Sanskrit language and literature for students.